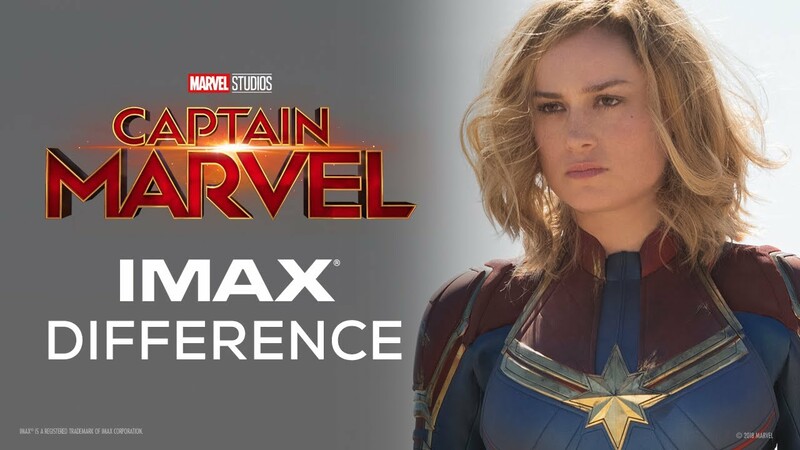 LOS ANGELES, March 11, 2019 /PRNewswire/ -- IMAX Corporation (NYSE: IMAX) today announced that Marvel Studios' Captain Marvel opened in IMAX® theatres this weekend with a $36.1 million global debut, becoming IMAX's fifth biggest opening of all-time and the first non-sequel film to crack the top five. The film also represented IMAX's best March opening and the second highest Marvel opening for IMAX globally. With this weekend's results, the Marvel Cinematic Universe has now crossed $1 billion in IMAX box office. Domestically, Captain Marvel grossed $14.1 million on 411 IMAX screens marking IMAX's second biggest March opening. 9 of the Top 10 grossing theatres were IMAX locations. "IMAX is honored to be part of the spectacular performance of Captain Marvel, the biggest superhero origin story opening in IMAX history that has earned its rank among the highest-grossing IMAX openings ever," said IMAX CEO Richard L. Gelfond. "Captain Marvel marks an incredible start to what is shaping up to be a very strong 2019 lineup and sets the stage for the highly anticipated Avengers: Endgame, which was shot entirely with IMAX® cameras." International IMAX weekend results for the film reached $22 million from 964 international sites and set new records including IMAX's best international Marvel opening and IMAX's second biggest international opening of all-time. In China alone, IMAX reported $10.4 million from 603 screens representing IMAX's biggest March opening in the market. 9 of the top 10 Captain Marvel locations in China were IMAX theatres. The film also delivered all-time biggest IMAX openings in 12 international territories, including Germany, Ukraine, India and Puerto Rico. The film is scheduled to open in Japan on March 15. "Congratulations to directors Anna Boden and Ryan Fleck, and to Kevin Feige and teams Disney and Marvel on a monumental opening that showcases the multiple powers of women," said Megan Colligan, President, IMAX Entertainment and Executive Vice President, IMAX Corp. "We believe this weekend's results are a clear indication that audiences around the world continue to seek out the biggest blockbuster events in the differentiated IMAX format." IMAX is headquartered in New York, Toronto and Los Angeles, with additional offices in London, Dublin, Tokyo, and Shanghai. As of December 31, 2018, there were 1,505 IMAX theatre systems (1,409 commercial multiplexes, 14 commercial destinations, 82 institutional) operating in 80 countries. On Oct. 8, 2015, shares of IMAX China, a subsidiary of IMAX Corp., began trading on the Hong Kong Stock Exchange under the stock code "HK.1970."